Silke Hilsing invented an impressive technic. A flexible touchpad allows the user to create 3-Dimensional spaces to fill up with sound-bowles, easy switch between news and some more. 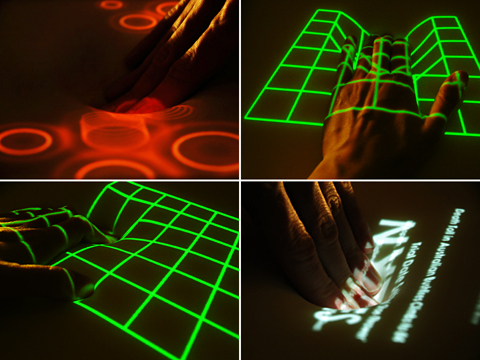 With an up-projektion the result get projected on the top of the soft touchpad. The impress has 4 kinds of applications. Application 1: You can put objects in motion and make them sound differently by deforming the surface. Draw a new object with different radius and pitch depending on the intensity of pressure. Application 2 + 3: Modelling a 3D-object by lower or higher intensity of pressure at any desired position. After Modeling, save the result and compare it with other results in a 3D gallery. Fly and zoom through the gallery by putting more or less pressure onto the display. Application 4: Squeeze out latest news (RSS-Feeds of different news agencies). It is an very interessting technic. I think the video explains it very well.